For me, there is a certain peace achieved after a day of riding. In that moment, I can drift away from the past, or my distraction of the future. This allows me to simply BE – soothed by the passing of the moments rather than the struggle of my thoughts. I believe that peace and calmness are essential to developing the true art of horsemanship. I still laugh when I remember my students’ faces as I galloped past them on a fat little cob during a trail clinic in Wales — eating an apple! The concept of peacefulness in full motion didn’t make sense to them. But, if I have true harmony and partnership with my horses, not even galloping at full speed should separate us. Peacefulness should also extend to teaching your horse something that is scary or new. Pressuring a horse when it is on adrenaline is never a good idea. This natural drug in the horses’s system sets off its flight-or-flight responses. Horses don’t think when they are on adrenaline. Yes, you can force a horse through the experience, but you are likely going to have to repeat this lesson – again and again and again — because the horse is not mentally present. The horse’s brain is shut off, and it is operating strictly on instinct. If you use calmness, clear communication with your body, and patience, your horse will learn that he can make mistakes, and retreat when he is fearful. He will trust you to show him the way through a problem. I believe that peaceful horsemanship starts with awareness – first of yourself, and then of your horse’s internal and external states. Are you tight? Are you worried? Is there a good reason for this? Can you foresee any issues during your groundwork session or your riding and if so, can you simply avert it by being passively proactive? And can your horse check in with you and see that things are indeed okay? Can he see that you have been a patient and progressive leader for him? Can he trust that you will not be afraid or offended by what he needs to do? Perhaps I notice more strongly now what a true partnership feels like because I also know what a false partnership feels like. I can feel the lack of attention and the lack of trust. I feel the discordant communications when a horse is terrified and unable to think. I can also feel the harmony and the moments of true oneness. I can see my horse reaching across our communication to ask me a question or answer confidently when he understands. 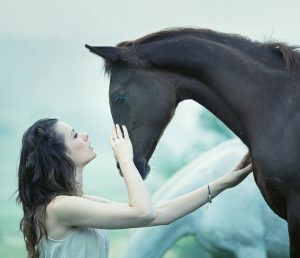 I feel the moments when my horse and I are slightly out of sync, and yet, I can refocus my energy and my intentions to bring us back to harmony in an instant. 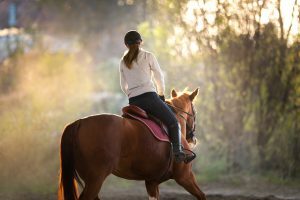 If I feel my horse and I are out of sync during new lessons or a moment of fear, I can ask my horse to trust me and let me guide him to the right answer. It’s like a dance. You can’t dance with another person when you are both intent on correcting or defending yourselves. You need silence between the notes. Stillness between moments of movement is vitally important to your horse’s understanding. If you do not pause or release completely, your horse does not have a chance to learn. 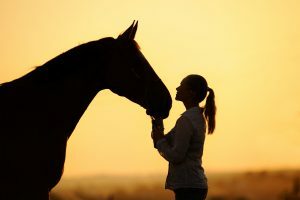 It is in moments of stress or learning with our horses that our attention to PRESENCE is so important to our communication and relationship with them. Horses are only in the now – adjusting to the present with reference to memories of past experiences. Create your best self when you are with your horses. Strengthen the positive responses with reassurance and attention. Your horses will seek this praise with enthusiasm and will approach future learning opportunities knowing that their partners have their backs. To learn more about Mattie, go to her website here. For many horses and horse owners, happy trailer loading is a mystery. Let’s face it, to a horse, the trailer is just a metal box on wheels where they can be trapped for an indeterminate amount of time. 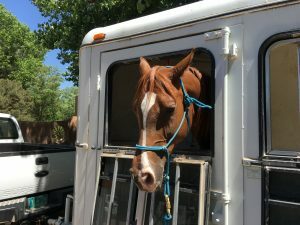 For an animal whose natural environment is thousands of acres to roam, it is easy to understand why trailer loading and transport can be harried for everyone involved. 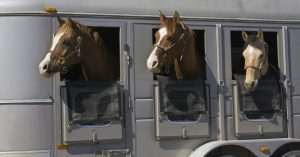 Not all horses have the luck or luxury of traveling in big semi rigs with a controlled climate and the cush of air ride. 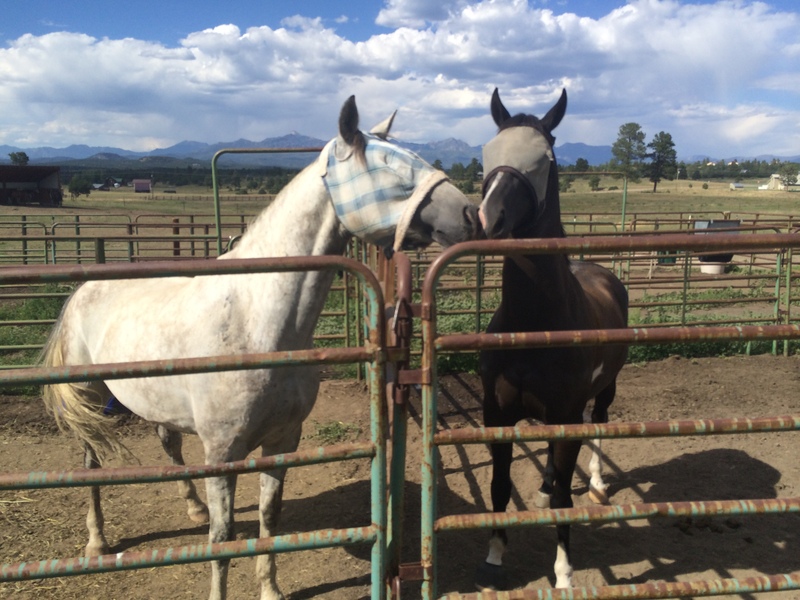 Every summer for the past few years, I have taken natural horsemanship courses at the Parelli campus in Pagosa Springs, CO. 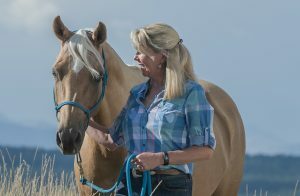 It is a great way for me to further the bond, connection, and relationships with my horses. 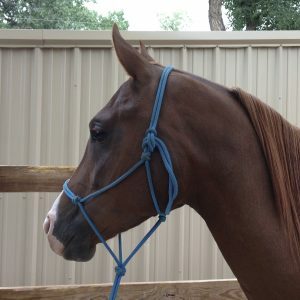 This summer will be no exception, and this time, I will take my youngest horse, Stormy, an 8-year old half-arabian mare. As I thought about taking Stormy to the ranch, it occurred to me she has not been in the trailer by herself very often. As a foal, she accompanied her mother for a visit to the vet a few times. My husband also played with her for the first year of her life, and they worked on trailer loading and other introductory experiences. In her adulthood, I’d taken her to several shows, but always in the company of one of my other horses. I took for granted that Stormy loads when led, and rides quietly with another horse. I remembered the few times I have trailered her by herself, the distance only a handful of miles, and she pawed and called for help the whole way. It hardly seemed fair that I will expect her to travel 4-5 hours to Pagosa Springs by herself. I decided to start trailer loading with Stormy from square one. What better way to test the foundation, right? The first day provided many distractions. Dogs barking, people riding bikes on the ditch behind our property, and the other three horses of her herd looking on like kids watching a movie. She wanted to look and be everywhere but the trailer. I had to remind myself what Pat Parelli always says – “It’s not about the trailer.” It is about the relationship. Here are some of the steps I’ve taken to help Stormy feel confident and secure enough with the trailer to load and travel alone. It is important to note that my trailer is a two horse slant load with a ramp. Slant loads provide more room for the horse to get into the trailer and are less claustrophobic than straight loads. First, we hung out at the back of the trailer with the doors open and ramp down. 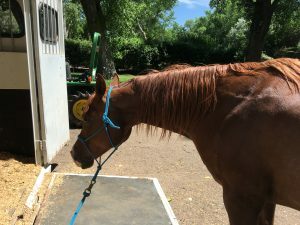 An extroverted horse, Stormy needs to move her feet when nervous, so I worked on yields (hindquarter yields and forequarter yields) near the opening of the trailer. I kept my stance relaxed and when she yielded well, I gave lots of praise. Then I asked her to investigate the trailer using the “approach and retreat” method. I asked her to touch the ramp with her nose and when she did, I took her away from the trailer. I did this several more times. Horses are naturally curious when they don’ts feel threatened. After we worked with “approach and retreat” for a while, Stormy soon found it comfortable to stand at the ramp. She sniffed it, pawed at it, and then put both feet on it. I knew she wasn’t ready to go in yet, so I let her hang out there for a little while and then backed her away. After doing this three times, I asked her to step further onto the ramp. This time, she got all four feet onto the ramp and started investigating the walls, the floor, the windows, etc. I heaped lots of praise, with “good girl” and rubs. I knew I could ask for more, so I backed her out and asked her to walk onto the ramp and put her two front feet inside the trailer. After she’d accomplished this a few times, I asked for four feet. She managed the task, but flipped around and rushed out head first. I am not comfortable with horses turning around in a trailer and going out head first, but I wanted her to know she could get out. I let her do this a few times. At the third or fourth time, she turned around and stood in the trailer backwards. Progress! I let her stand there for as long as she wanted. When she walked out, I repeated the process of asking her to load all the way in. I did this three or four times. The next time she loaded with all four feet, I blocked her with my stick so she couldn’t turn around. With gentle bounces of the rope, I asked her to back out. Stormy understands this suggestion, so she backed out without issue. 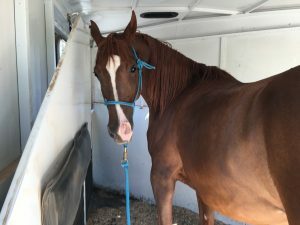 After Stormy felt comfortable standing in the trailer for several minutes at a time, and could back out calmly, the next time I asked her to load, I closed the partition and stood in the trailer with her. I continued to praise and rub while she stood quietly, and after a minute I opened the partition and backed her out. We did this three or four more times. We had accomplished so much in this session, that I felt it a good time to stop. It is important to know when to stop – when your horse accomplishes the task in a relaxed and confident manner. This is hard to do because when things are going well, it is natural to want to keep going. It’s important to remember that trailer loading, or doing anything that is out of your horse’s comfort zone, can be mentally and emotionally taxing for them. Quit while you are ahead. Your next session will go so much faster! In the following session we repeated the above four steps, and once Stormy could stand quietly with the partition closed for several minutes, I closed the door and took her for a ten-minute ride. Stormy and I are still working on our trailer loading until we leave for Pagosa at the end of July. I will slowly increase our excursions and unload at different “safe” areas around town, like the public arena or trail heads near the Rio Grande. We’ll do some exploring either on line or under saddle while we are out, and then load up again, and head home. I will keep you informed on our progress! 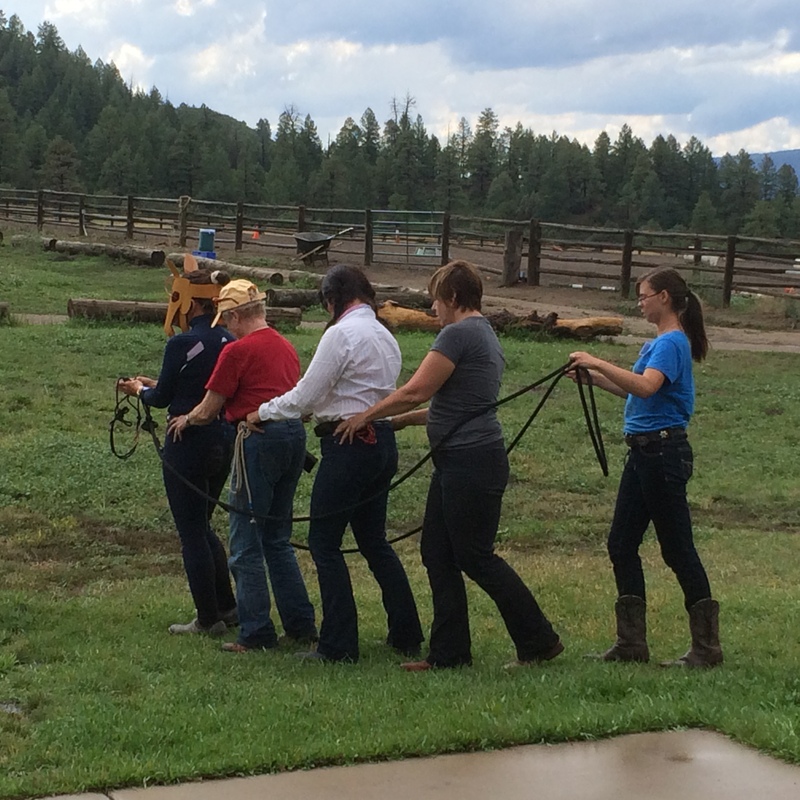 To learn more about the Parelli Program and trailer loading click here. Making time to spend with your horse can sometimes be a challenge. Family responsibilities, work, and everyday life commitments sometimes don’t allow us to be with our horses as much as we want. When we do get the opportunity, we want to be able to make the most it. We want to ensure that our relationship with our favorite horse pal is still on track. Here are some tips to get the most out of your play date with your horse. 1. Schedule an appointment with your horse at least once a week and stick to it. As you know, this is harder than it sounds. With responsibilities and distractions pressing on us every day, it’s easy to put off our horse time for more “important” things. I know I have been guilty of this myself. But, we have to remember—we have a responsibility to our equine pal. You probably didn’t purchase him or rescue him to have him sit in a pen by himself, or never have any human interaction. Tending your relationship with your horse is as important as tending your personal or business relationships. Your horse needs you to check in with him on a regular basis. You have to make time for him to get the most out of your relationship. 2. Greet our horse with respect and friendliness. Sometimes we get so focused on what we are going to do with our horses, we just walk straight in to the pen or field and halter up. If you think about it, isn’t that kind of rude? If you made a date to pick up a friend for lunch, you wouldn’t just storm into her house, grab her hand, and drag her to the car, would you? I hope not! The same applies to your horse. Approach the pen with a friendly, non-rushed demeanor. Bring carrots or cookies. Scratch your horse’s favorite itchy spots. Talk to them. Greet them. Then slip on the halter. I promise, it will make a difference in whatever you plan to do with your horse that day. 3. Use essential oils with your horse during your grooming session. As I mentioned before, with our crazy schedules, we need to make the most out of the time we get to spend with our horses. It’s good to have an idea of what you want to work on, whether it’s working on the ground or in the saddle. Keep a list of the things you’d like to accomplish with your horse, and then pick one or two for the day. Have a third in your back pocket in case things are going swell and you are both game for more fun. Have a backup plan in case of inclement weather or other obstacles come your way. You’ve scheduled this time, so make the most of it by being organized. Your horse will see and feel your leadership, and it will help her from getting bored. 5. Adjust if the plan gets derailed. Dealing with a mare in season can be a pain. Figuring out how to help her can sometimes be a mystery. While some mares show little symptoms of their heat cycle, other mares show sides of themselves you didn’t know they had. And, their behavior can vary from month to month. At times they can be fractious, angry and distracted, and at other times they can be sullen, depressed, or moody. In other words, not themselves. Like women, mares can feel upset or physically uncomfortable from their cycle. 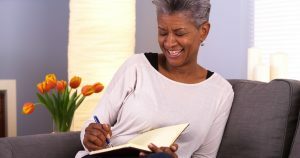 There are many ways to manage this ranging from using natural supplements to prescribing hormone therapy. It is important talk to your vet about what your options are and what will work best for you and your horse. My 8-year old Arabian/Saddlebred mare, Stormy, is often uncomfortable when she is in heat. Emotionally, she becomes distracted, herd-bound, sometimes frantic, worried, and even more right-brained than usual. Physically, her back gets tight causing saddling and riding to be painful. Progessence Plus oil contains the natural progesterone produced by wild yam extract. With sacred frankincense, peppermint, bergamot and coconut, it has soothing and uplifting properties that can calm or combat sluggishness. Dragon Time, a natural phytoestrogen (dietary estrogen) is a blend of jasmine, clary sage, marjoram, lavender, fennel, and blue yarrow essential oils that helps to promote emotional balance in human and animal females. It releases anger, frustration, and other emotions associated with a monthly cycle. This sweet smelling oil helps to balance hormones. It compensates for both lack of hormones and excess of hormones. It calms and relaxes, and also supports the nervous and circulatory systems. This light blue oil supports the body’s natural response to irritation by clearing heat from the body. It’s sweet, grassy aroma promotes feelings of peace and calmness. It is similar to yarrow in its properties to relieve physical discomfort. Clary Sage works as an anti-spasmodic and is good for mares prone to back pain and tension during their cycle. It stimulates the production of progesterone and is warm and comforting. It also promotes focus and relaxation, and also helps with previous trauma. Present the oil with the cap on, first. See how she reacts. to it, you might take off the cap and present it to her again. Go slowly. the nose, flipping of the upper lip. If you get the green light, rub a few drops on the oil on your palms, rub on the nose, poll, chest, withers or insides of the hind legs. What kind of essential oils to use on your horse? I first started studying natural horsemanship in 2012. At that time, I thought I had a good foundation in my knowledge and skills. My relationship with my horses seemed solid. 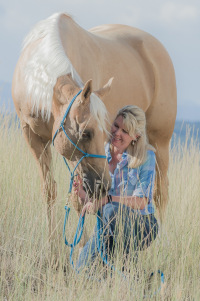 Once I started learning about the principals and practices of natural horsemanship, I realized that I had little understanding of what it is to be a good partner to my horse. My knowledge, my practice, and my “feel”, needed improvement. I had basic handling skills, decent riding skills, and I did fairly well at competition. To many, that would be enough—and there is nothing wrong with that. But, I wanted more. Seeing the holes in my knowledge, my understanding, and my foundation was startling, humbling, and even a little dispiriting. Yet, recognizing my weaknesses only made me want to turn them into strengths. I had found a challenge. And, nothing excites me more than a challenge! As Karen Rohlf says in her book, Dressage Naturally … Results in Harmony, “to find holes in your foundation, it is a gift.” She further explains that we must continue to work on our foundation, and constantly nurture it. One of the things I have learned in my own journey is that to excel at anything in life, we must always go back to the basics. We must revisit our weaknesses, work on them, and challenge them. Having patience with the process and with ourselves is never easy, but it can be well worth the time it takes to go back. While surfing the internet, I stumbled across the video below that was shot in 2016. One of the Parelli Natural Horsemanship instructors asked me to say a few words about the Parelli program and what I valued most about it. What I saw then, is the value of going back to the basics. Like with anything in life, if we want to learn and move forward, we often must take a few steps back. It never hurts to go back to the beginning—especially with fresh eyes and a new perspective. I like to think of it like adding on to a beautiful quilt. Sometimes we have to go back and repair some of the stitches that have worn over time, but it only makes the new patches we sew on all the more beautiful and bright. Ever have one of those weeks where no matter how hard you try, you just can’t seem to work in a ride? 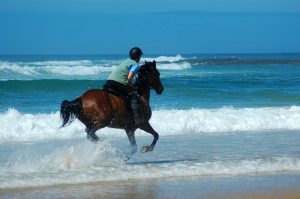 Sometimes the weather is bad, or the arena is out of commission, or the trails are too “buggy.” It’s too hot, it’s too cold, too windy, or you just can’t fit riding your horse in your schedule. Sometimes life just gets in the way of your riding fun. 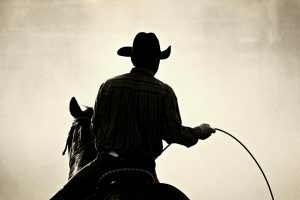 Here is a list of things to do “out of the saddle” when you can’t get that ride in, for whatever reason. #1. Spend undemanding time with your horse. Take 15 minutes to go out and sit with your horse. 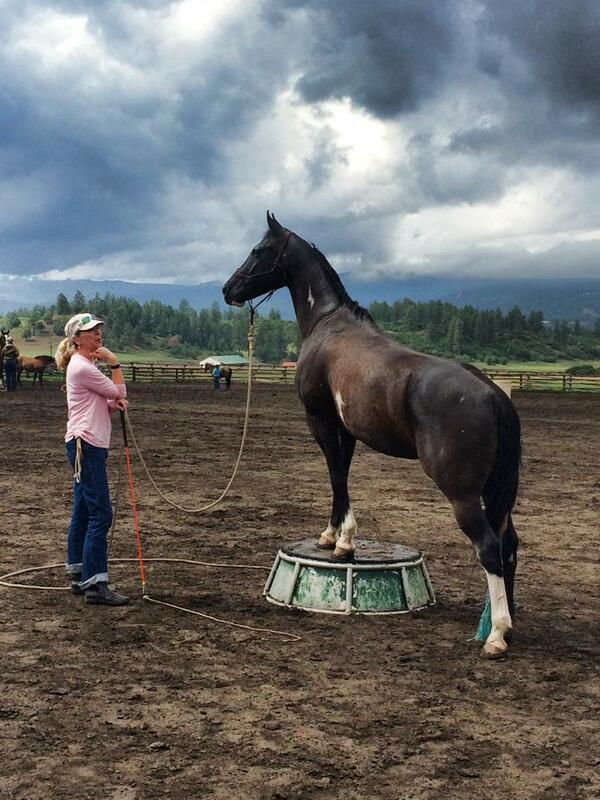 Turn over a bucket in the stall, pen, or even the field, and just “be” with your horse. Take some cookies or carrots. Share an apple. Often we get in a rush to “do something” with our horses. Take the time to just enjoy his or her company. #2. Watch instructional videos or work on your online courses. Rainy days are great for this kind of activity. Get out your favorite notebook, pop some popcorn, and settle in for some good horsie education. 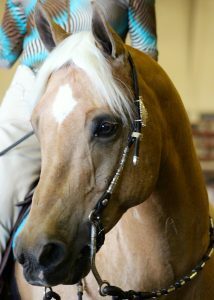 I watch Parelli Natural Horsemanship videos or Karen Rolhf Dressage Naturally videos. If you aren’t a member of these communities, YouTube has a plethora of other fun videos to watch that will help you learn new skills. #3. Clip and bathe. Give your pony a beauty treatment. This is especially nice in hot weather. Use a conditioning shampoo and ultra-hydrating conditioner. Summer weather can wreak havoc on manes and tails. Clipping the hair around your horse’s fetlocks can help thwart scratches. Set up a hay bag for your buddy to much away while you clip and scrub, and then later when he or she dries. They’ll thank you for it! Don’t forget to use fly spray afterward! #4. Work on your communication on-line. See if you can get your horse to move his/her hindquarters and forequarters with the lightest possible signal. Can you get them to back up without pulling or pushing? See if you can accomplish these tasks with just your mental intent and energy. It’s amazing how little it often takes for us to communicate with our horse partners. #5. Organize the tack room. Make “keep”, “donate”, and “sell” piles of things you don’t plan to use any more. It might be a great way to help a horse rescue or make a little extra cash. #6. Clean your tack. Don’t wait for the next horse show or clinic. It’s good to keep your leather clean and supple. Take a tooth brush and scrub the grime off your horse’s bit. Polish the silver on your western saddle or the stirrups of your English saddle. You’ll feel spiffy the next time you get to ride. #7. Wash winter blankets and fly sheets. There is nothing worse than having to use a crusty, stinky fly sheet or blanket. Don’t wait until it’s time to use it. Most laundromats have large, industrial-sized washers that can handle the load of a horse blanket or sheet. Air dry in the sun for less shrinkage and freshness. #8. Wash brushes and grooming tools. Soak brushes in a bucket full of sudsy water. Let them air dry in the sun. Pull hair out of mane and tail brushes—use that trusty toothbrush to get the crud from between the tines. Clean out your grooming bucket and reorganize your newly shined and clean grooming tools. There is nothing like the instant gratification of seeing what was once dirty, clean again. #9. 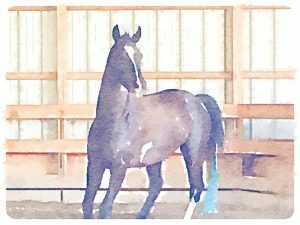 Journal about your last ride and what you hope to do the next time you are playing with your equine friend. What could you do differently? What could you refine? Been on the trail lately? If not, maybe hand-walk your horse pal on the trail for you to get some exercise and to help desensitize your buddy to the monsters that lurk outside the pen or arena. #10 Set up some play-dates or trail rides with friends. Being with your horse is fun, but being with your horse, your horse friends, and their horses is even more fun! Come up with some games to play or obstacles to work with. Plan a picnic lunch for that morning trail ride. What about an evening or night ride? If going out after dark, don’t forget to plan for adequate lighting and bug spray—for you and your horse! 2. Make and teach no assumptions. 3. Communication is two or more individuals sharing the same idea. 5.The attitude of justice is effective. 6.Body language is the universal language. 7.Horses teach humans, humans teach horses. 8.Principles, purpose, and time are the tools of teaching. Chaco and I just completed the first week of our Journey to Level Four at the beautiful Parelli Ranch in Pagosa Springs. I will highlight the first two days with this post and then try to catch up as the week goes on. We have been so incredibly busy, the days just fly by. But what fun we are having!! 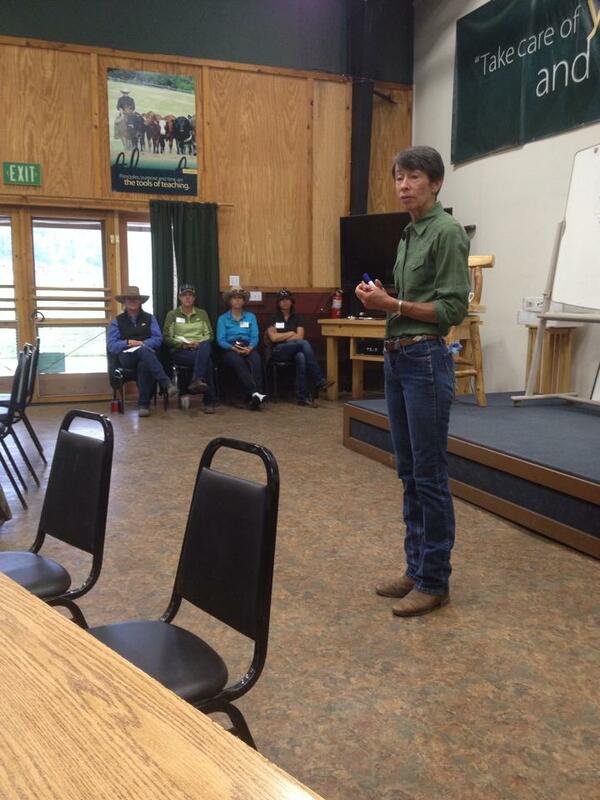 The first day we got the horses settled and then had an orientation meeting. We met our wonderful instructors, Nita Jo Rush, Margit Deerman , Erin McKee Fowle, Karen Kartchner and Ashley Dudas. We played a game of tag the water bottle (there is a name for it, but I forgot what it is!) with our carrot sticks and savvy strings, had lunch, had an on-line demo and then were asked to go get our horses to play on-line. The goal of the first day’s lesson was executing Level One With Excellence. Chaco was multi-tasking – by that I mean he was doing what I asked, but looking everywhere but at me. When I asked for advice, Nita Jo suggested I be more progressive and more provocative, meaning I needed to change things up on him, think ahead, have a plan, ask for more (speed, distance, subtler phases) basically challenging his brain to become calm, connected and focused. Day Two started with rope handling skills. We were all asked to get our 45′ lines and practice throwing our ropes and coiling them back in evenly and in order. This is much harder than it sounds, but it was really fun! Erin taught us how to use our rope to get into a power position to prevent a run-away or out-of-control situation and we did simulations with one another. Some “horses” were naughtier than others, but we managed to keep it under control! We also discussed patterns that we have developed that need to change, such as letting our horse get ahead of us and working on getting a good circling game. The circling game is the only game of the 7 where the horse learns to take responsibility (maintaining gait, looking where he is going, etc.) because it is the only game where the human is not moving their feet (or shouldn’t be :P) Nita Jo then gave a wonderful demonstration of Driving From Zones 4 and 5. We were soon rained out and had to head indoors where we did a simulation called Conga Horse. 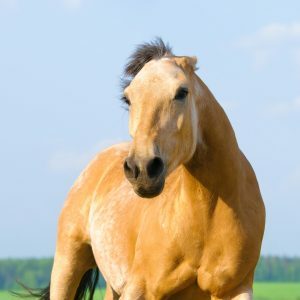 This is a great simulation to see and feel what a horse sees and feels when we are communicating with him. For instance, did you know that when you are standing directly in front of a horse at one to three feet distance, they cannot see you at all??? That is one of the reasons that communicating with your energy is so important. The horse needs to “feel” what you are asking. Stay tuned for more adventures in the days ahead! Saturday we arrived in Pagosa Springs and are now lodging at the beautiful Mountain View Horsemanship Ranch. After unloading Chaco and getting him settled, we got the motorhome set up and ready for the next day and a half before we head over to the Parelli Ranch today. Chaco had a big day yesterday with adjusting to his new surroundings without the companionship of his herd. He’s making new friends and after some energetic play sessions with me, he finally settled — just in time to move to a new home for the next few weeks. Today will also be a big day for the boy, but I have hopes that we can make the adjustments together and continue to work on our partnership. I am so looking forward to this journey! 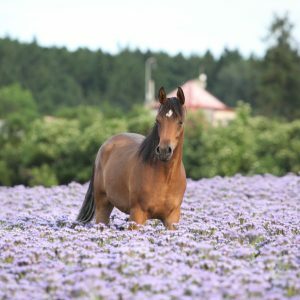 Sign up to receive "5 Essential Oils to Calm Your Horse"!